DEWALT has a well-earned reputation for designing and manufacturing many of the worlds most reliable and best-performing professional-grade power tools. And every product is forged with DEWALTs unwavering commitment to producing tools and accessories that can withstand harsh jobsite conditions and meet the unyielding day-to-day demands of professional contractors. And now, DEWALT has applied that same no-nonsense, Guaranteed tough philosophy to its new line of heavy-duty hand tools. Designed to deliver the same standard of excellence as its power tools, DEWALT hand tools were conceived on the jobsite and built to exceed the expectations of professional homebuilders, remodelling contractors, plumbers, electricians, industrial maintenance mechanics, drywall hangers, demolition crews, and all other construction trades. For added peace of mind this product is backed by our Limited Lifetime Warranty. 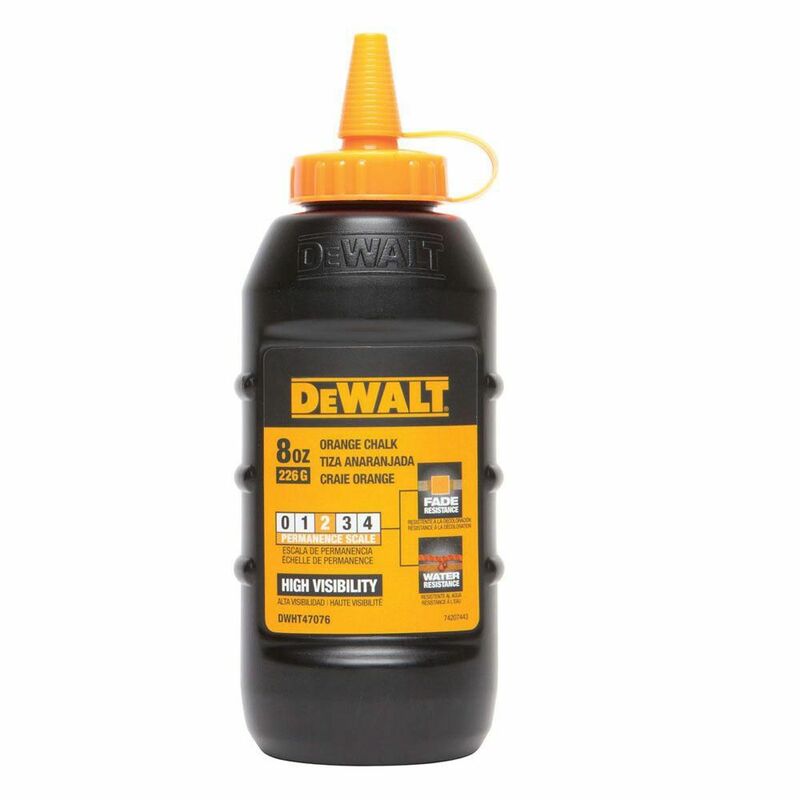 The DEWALT DWHT47373L 3:1 Chalk Reel with Blue Chalk is convenient and durable. The flush handle allows for compact storage while the 1mm line creates tight and clean marks. The intergraded clutch allows for reduced line jams and smooth line release. Built with an ergonomic shape for secure grip and feel. The DEWALT DWHT47376L 6:1 Chalk Reel with Red Chalk is convenient and durable. The flush handle allows for compact storage while the 1mm line creates tight and clean marks. The intergraded clutch allows for reduced line jams and smooth line release. Built with an ergonomic shape for secure grip and feel. The original marking chalk for temporary markings on metal, wood, stone, and paperboard since 1835. This smooth marking chalk is ideal for bright temporary marks. Available in fourcolors. White is coated for clean handling. Tapered 4inch. x1inch. stick. Packed 72/bx. 8 Oz Chalk - Florescent Orange DEWALT has a well-earned reputation for designing and manufacturing many of the worlds most reliable and best-performing professional-grade power tools. And every product is forged with DEWALTs unwavering commitment to producing tools and accessories that can withstand harsh jobsite conditions and meet the unyielding day-to-day demands of professional contractors. And now, DEWALT has applied that same no-nonsense, Guaranteed tough philosophy to its new line of heavy-duty hand tools. Designed to deliver the same standard of excellence as its power tools, DEWALT hand tools were conceived on the jobsite and built to exceed the expectations of professional homebuilders, remodelling contractors, plumbers, electricians, industrial maintenance mechanics, drywall hangers, demolition crews, and all other construction trades. For added peace of mind this product is backed by our Limited Lifetime Warranty. 8 Oz Chalk - Florescent Orange is rated 5.0 out of 5 by 1.